Mario Lemieux knew what he was doing when he pushed for NHL salary restraint years ago. PITTSBURGH — The salary cap was a passion project for Mario Lemieux, the owner, when the NHL wrestled with it during the 2004-05 lockout even though he knows it would have been something Mario Lemieux, the player, would have fought to the bitter end. “We couldn’t compete with the (New York) Rangers and L.A. and the big markets and Chicago and Detroit,” the Pittsburgh Penguins Hall of Famer-turned-chairman recalled. So Lemieux pushed for the cap during the NHL’s lost winter, well aware the ripple effects would include a rise in league parity at the potential expense of the dynasties that have been a part of the league since it started awarding the Stanley Cup nearly a century ago. The math was easy for Lemieux. Better to have 30ish solvent and competitive clubs than just a handful. “The salary cap gave us a chance to spend to the cap and be on level playing fields with the other teams,” he said. The cap has proven to be more of a speed bump than a road block for the Penguins. The proof was all around Lemieux as he spoke on the ice at Bridgestone Arena on Sunday night after the Penguins nudged past the Nashville Predators in Game 6 of the Stanley Cup Final to become the first team in 19 years and the first of the salary cap era to win back-to-back titles. “It’s hard to win the Cups as we’ve found over the last 10-12 years,” Lemieux said. The Penguins flew home Monday with the Cup in their possession for the third time in nine years. A downtown parade is scheduled for Wednesday, a party that’s on the verge of becoming a rite of late spring. Pittsburgh has done it by investing heavily in their core group and finding the right complement of players and staff around Sidney Crosby, Evgeni Malkin and Kris Letang to make it work. That’s not how it’s supposed to work nowadays. Championship windows are supposed to be narrower with the cap in place, not wider. Sure, Chicago has won it three times in six seasons in the cap era but the Blackhawks were forced to blow it up after 2010. The Kings won it all in 2012 and 2014, and are now in the process of starting over. “Your goal is to win every year and our team just had a collection of guys that knew how to win, knew how to find ways,” Crosby said after picking up his second straight Conn Smythe Trophy as playoff MVP. Having a coach with an ability to challenge his stars without alienating them and a general manager with a knack for finding the right pieces helps. When GM Jim Rutherford replaced Ray Shero in the summer of 2014, he raised eyebrows when he said he only planned to be in the job a couple of years. The Penguins are right up against the salary cap annually but they also don’t overpay their stars. Considering their value to the team both Crosby ($8.7 million) and Malkin ($9.5 million) are bargains. They’re not the only ones. Rookie Jake Guentzel (NHL rookie playoff record-tying 21 points), Bryan Rust, Conor Sheary and Scott Wilson all found themselves playing vital roles alongside Pittsburgh’s cornerstones at some point during the postseason. None of them had a cap hit of more than $675,000. No wonder Malkin is hardly in the mood to put his career into perspective. He’ll turn 31 next month. He, Phil Kessel and Letang are all under contract through 2022. Crosby until 2025. If Malkin and Crosby can stay healthy, Pittsburgh will certainly be right there. 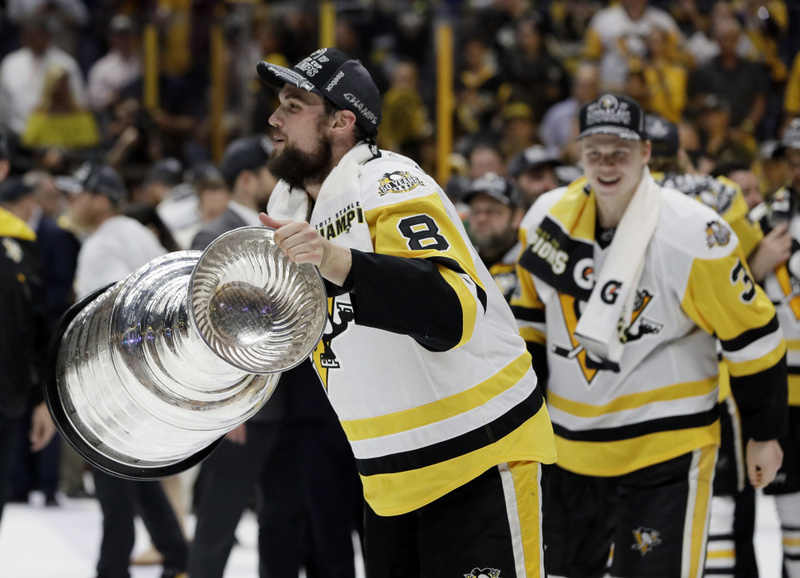 Oddsmakers made them the early favorite for a three-peat, something that hasn’t been done since the New York Islanders won four straight from 1980-83, a full year before Lemieux made his NHL debut and nearly a half decade before Malkin and Crosby were born. There will be turnover. Goaltender Marc-Andre Fleury’s handing off of the Cup to Matt Murray was a symbolic passing of the torch. Fleury will almost certainly play elsewhere next season and defenseman Justin Schultz is a restricted free agent but may have played himself into a contract too rich for the Penguins to match. Rutherford and Sullivan will get to work trying to fit the pieces together again. Their franchise cornerstone will take a brief breather this summer, maybe go fishing back home in Nova Scotia and then start pointing toward next season. Over and over and over again if you can.